Serving traditional Tex-Mex cuisine, Poco Loco is the place to be for authentic Mexican food in Burton, MI. We have everything from your favorite enchilada to pork tamales to soups and - of course - tacos. Our food is fresh made from scratch, and our meats are never frozen. We even grill all fajitas outside to get the perfect, savory flavor. We offer a dine-in cafe as well as takeout and catering services for all your events. Call us today for more information! 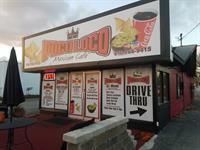 TEXT the phrase pocoloco to 57711 to stay up to date on specials and chances to win free food!